Searching for jobs online? But, confused which job portal would direct you towards the right way? Well, here is the solution. Currently ranked as the #1 job website, Indeed.com provides you with multiple choices from all over the world. The website acquires 200 million visitors every month. Launched in the year 2004 by Paul Forster and Rony Kahan, Indeed took over the market quite fast and have been giving a tough competition to other similar job portal since then. Every second job seeker must have visited Indeed.com at least once. 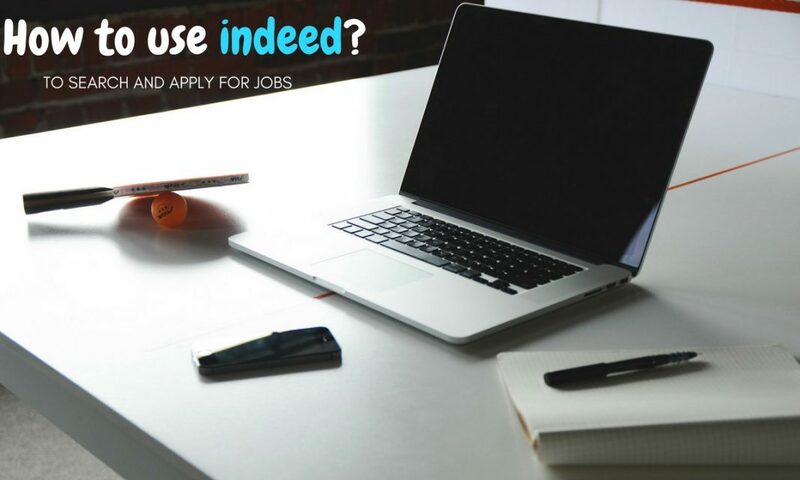 The following mentioned are few tips on how to apply for job on indeed. 1. Why choose this site over others? With several other employment search engines available, it might occur to you as what extra does this particular online job website brings you, that you will choose it. It is available to the users of more than 60 countries and in 28 different languages which gives the users a huge exposure thus making it a great platform for job hunting. The user interface of this website is pretty simple and very friendly compared to others. And the features that this job portal has are also quite upgraded and unique. This job portal is used by job seekers three times more than LinkedIn, Career builder and Monster combined. This information would probably not make you rethink before opening an account on Indeed immediately. As an employer, this job portal lets them choose between free postings of advertisement or pay a subscription for it. Since free posting is available therefore more and more employers choose Indeed. As a result of which job seekers flood into this job portal for employment. Besides general search option, there’s also an option for Advanced Search Function which allows the job seekers to search by a particular pay scale or a certain geographic radius so that they don’t have to travel to outer states for an interview. Random job hunting can lead you to nowhere at the end of the day. Therefore you need a clear vision about the trending jobs in the market, market competition for your preferred job, per capita job postings, required task from a particular post etc. Be thankful for it as it supplies you with all the intricacies and helps developing in you a better idea about which job you are fit for. You can search by job titles for vacancies or post your own resume with all your qualifications, experiences and skills. Also, you can update, make alterations or hide anything in it whenever you want. This definitely increases your chances for a better and easy hire. There is also an option for sponsored jobs. The cost varies from $0.25 to $1.50 per click. It also enables you to keep a check on the results of your job postings. The more you are willing to spend on per click, the more your post would be visible by prospective employers. It even has proved to be beneficial for employers since it facilitates them with Applicant Tracking System where they can keep a track of the candidates that have applied. If this was not enough to impress you already, then this site has more in store for you to make you shift from your current job hunting engine. It also enables you to turn on notification alert for any new job that matches your criteria, so that you do not miss one. You can do that either by clicking “My Subscriptions” and get alerted by an email every day recommending the jobs which are suited best for you. Or, you can even receive emails on a specific job search that you have made. 7. How to have a hassle-free quick search on Indeed? Indeed is smart enough to match up with your whims and criteria. However you throw your demands, the site will give you the best possible results. Enlisted below are some easy hacks to make your hunting for jobs on this job portal fruitful. If you are still asking yourself whether to go for this site, here’s why you must. For instance, if you have typed the phrase “office accountant” in the job portal, it will show you results with where the employer wants someone to hire particularly for that post, or vacancies of only “accountant”. Some results will have both the words together and few others in different positions. Therefore, you would not be leaving any stone unturned for a job. Other than directly searching by typing the job title in the search box, you can also go through a detailed search through your best skill. For instance, if you have good “Microsoft Excel Skills”, you can search by that and will be shown all the results where the employer seeks someone with that particular skill. You just need to add the word “title” before your desired position. A list of the jobs with that title will flash on your screen immediately. Remove the “title” and jobs will appear with the mentioned position in both the title and body of the ads. If you have a specific job title in your mind that is a phrase, Indeed will indeed show you the results for that as well. Like, there are several types of accountants and you are interested in particularly the post of “forensic accountant”. It will come up with results of those ads that include “forensic accountant”. Just like searching for your preferred job titles, it also gives you the opportunity to search by particular employer. For instance – if you want a job in “Oxford University Press”, you can search for the vacancies by typing company: “Oxford University Press”. Moving a step ahead, this amazing employment job portal even lets you search for a particular post in a particular company. Imagine, if you want to achieve your dream job! Similarly, like the previous hack you just need to type in the search box title:” junior editor” company: “Oxford University Press”. If you are good at a skill such as communication and wish to do a job which requires the proper utilization of your skill, you have selected the right place to search. All you need to do is type “communication” in the search box and a probable list will be visible. Again, if you have already set up your mind for a post and want it to be in a particular sector, this job portal will help you find that. For instance – you want the job as an assistant in a publishing house; just combine the two words – title: “Assistant” “publishing house”. Suppose you want a job as an assistant in a particular publishing house but do not want to be burdened with accountant duties, you can actually minus that. For instance – title: “Assistant” – Accountant Company: “Swift Publishing House”. Finally, you can use the option of Advanced Job indeed Search where you can specify your required details of jobs that you are looking for such as – pay scale, full time or part time jobs, paid internship or training, etc. With thousands of job postings by the employers every day and in fact every hour, you need to be quick about making a decision whether to take up a definite job. If you consider returning back to a previous option, it becomes almost next to impossible since you are not the lone candidate applying for that job. Vacancies can fill up pretty quick on Indeed. Amidst several other benefits of using this site, a very morally supportive one is that this job portal furnishes its members with a platform for discourse on various companies, modern trends, and particular posts or even on topics such as the distress of frustrated job seekers. It is really commendable that the website developers have thought of such a platform which is interactive as well as helpful. Besides providing a detailed data of jobs by the employers for the sake of the candidates, there are also graphs which show the trends of various jobs in the market currently. This helps many job seekers choose between jobs. To provide aid and support to the job seekers, there is also Advanced Search Engine, resume writing options etc. From the year 2011, Indeed has started allowing jobs directly on their own website. They let the candidates upload a resume and facilitate storage. If you are a beginner at job hunting and are not quite sure as how does the search portal exactly works or how to create your own account, the following steps can guide you right away. After you have opened the homepage of Indeed.com there are two search boxes to help you through. The first one requires for specific job titles, companies, posts, a company name in particular, or a post in a company – which you need to fill in. The second one asks you a specific city or state where you might be seeking the job. Clearly, this job portal gives you an option for sorting out your priorities in the job. The next step requires the uploading of your resume. As a prospective job seeker, you need to make sure your resume is interesting enough for companies or employers to choose you from amongst thousand other candidates. You can mention about your special skills, hobbies, previous job experiences in it. The better your resume is, the higher are your chances of getting hired faster. When you have already made your job search you want, you will be listed down with various vacancies. On your left-hand side, you can view details about the total number of part-time jobs, full-time jobs, contractual, internships, training, walk in and fresher of your list. You can either save the job for later or directly apply for the post. However, in both the cases, you need to make an account on their website after which you will become a member. In case you are not satisfied with the options of the existing page, you can just shift to the next and continue with your search. If your resume gets selected by a company, you will be notified by the website through an email notification. Hence, even if you have not logged into your account, there is practically no chance of missing out on a job. Indeed takes care of such things. Although Indeed charges the employers for posting job offers if they subscribe to it, the employees here enjoy a privilege for their account can be made absolutely free. Unlike various other job portals available in the market, it does not charge the job seekers. While on one hand, you can choose your preferred location (city/state) for the job, you can also choose how many kilometers away from your current location do you want your job. If you assume that searching for jobs on online websites would deprive you of the benefits of government jobs, this site will prove you wrong. Here you can browse through government jobs, fresher and even walk in jobs. Another good thing about indeed is, it does not work partially judging by the size of the companies. The website functions dedicatedly for making the right person the right job. Therefore, even if as an employee or employer your demands are limited, you are surely to get your fit. After the website’s massive success, the developers have even launched an app for mobiles. The website works fine on iOS platform, Android platform, Blackberry device, and PCs. Even if some websites lets you create an account for free, they charge when you go for applying in companies. But, it does not do so. There’s no room for doubt as to whether the company you are applying for is fake or not because Indeed also verifies the employer details beforehand. Here’s an end to your job hunt with Indeed.com. Next articleTop 28 Companies That Use Child Labor Still !